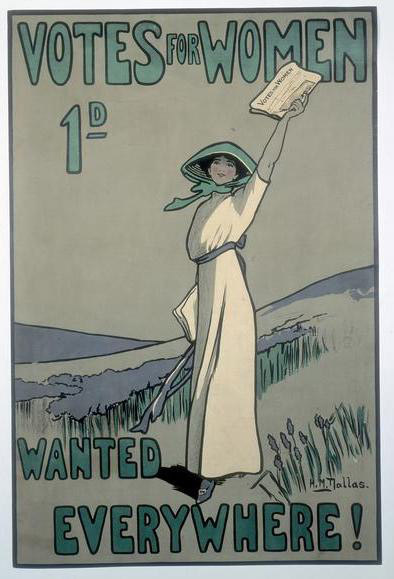 Suffragette Emily Wilding Davison’s Epsom Derby protest remains a controversial act, with some arguing to this day that it damaged the case for women’s suffrage. 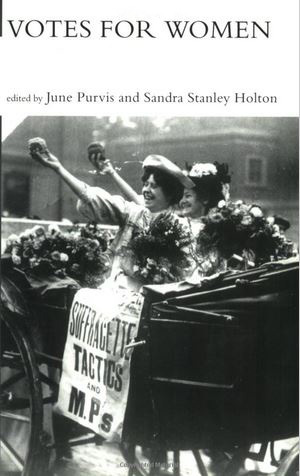 In the following guest blog post, June Purvis, professor of women’s & gender history at Portsmouth University, challenges the negative stereotypes still espoused by some critics of Emily Wilding Davison today. Emily Wilding Davison (1872-1913) has been represented by many male historians as a suicidal fanatic. Such comments must be challenged. Emily was not an unbalanced, suicidal fanatic but a sensible, level-headed, religious women, a risk-taker who probably did not intend to die. 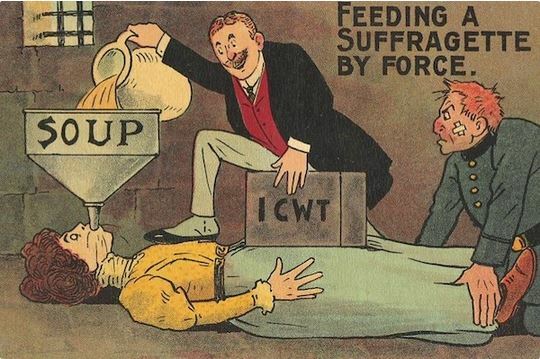 Anti suffrage propaganda postcard © June Purvis. Please do not reproduce this image without permission. A clever woman, with a First Class degree in English Language and Literature, she joined the Women’s Social and Political Union (WSPU) in 1906 and after three years of juggling her teaching and suffrage work, devoted all her time to the women’s cause – thus facing financial insecurity for the rest of her life. Such worries were partly offset by the warmth and support of a web of close friendships that included other suffragettes such as Mary Leigh. Determined on political protest, Emily introduced a range of imaginative tactics. During 1910 and 1911 she evaded the security staff at the House of Commons, hiding there on three separate occasions, once in the hot-air shaft and twice in the crypt. In December 1911, she initiated a different form of protest when she was arrested for setting fire to a letter box acting, he claimed, entirely on her ‘own responsibility’. In the dock she explained that she had engaged in such action partly as a protest against the vindictive sentence and treatment of ‘my comrade’, Mary Leigh – who had been sentenced to two months imprisonment in contrast to Lady Constance Lytton who, despite the great damage she had inflicted, had been sentenced to only two weeks. Emily, who was to be forcibly fed 49 times herself, wanted to stop this torture being inflicted on her comrades and came to believe that only by the giving of a life would the Liberal Government of the day stop such a horrendous punishment. Although we shall never know what went through her mind that fateful day of 4 June 1913, when she ran onto the race course at the Derby, she undoubtedly undertook her final militant act, knowing it might have fatal consequences. A devout Anglican, she risked her life to save her comrades from any further suffering. A courageous, kind woman, fighting for democracy, she left her imprint on British history. Powerful legacy: the bravery of Emily Davison & her sister suffragettes in campaigning for the right to vote still resonates today. Voting is just the start. We’re busy planning future creative projects that will encourage young people and women, not only to vote, but to step up and lead. There are exciting times ahead so please do get in touch! Listening and valuing what others have to say is very much a a part of what we do. It matters to me that you are heard and not just at election time.